Be sure to click on the linked photos for closer views! As early as the mid-1800's, the railroads in both England and the United States were using lanterns, hung from crossbars, to give railroad men a signal visible by night as well as by day. For the control or direction of street traffic by colored lights however, England appears to have led the way. The worlds first traffic signal using colored lights was installed in December of 1868 at the intersection of George and Bridge Streets near the Houses of Parliament. It had been installed in response to a suggestion by a select committee that railway signal gear be adapted to street traffic. It's purpose was to give protection to members of Parliament and lesser street crossers at a point where vehicle traffic was very heavy. The resulting signal was invented by J.P. Knight, a railroad signaling engineer. Shown here by a surviving drawing, it was to have been an imposing 22' high and crowned with a gas light. The semaphore arms, when extended horizontally, meant "Stop". When lowered to a droopy 45° angle, meant "Caution". At night, a green light and red light were used in conjunction with the arms. Although it is entirely possible and probable that other attempts were made to control traffic by colored lights after this London experience, no recorded account has come down to us until the earlier part of the 20th century. POLICE CONTROLLED DEVICES- The very first traffic "signals" in the United States were of the "railroad switch stand" type...that is they were rotated manually by a policeman 90 degrees to show the indication "STOP" or "GO". Cleveland, Ohio was the birthplace of the first traffic signal installation in the United States. The first signalized intersection was located at the intersection of 9th St. and Euclid St. around 1908. At night very often, a lantern was used at the top to show either red or green displays. This method was rather labor intensive because an officer had to be located at every busy intersection in which these were used! In the examples shown here, the top two photos on the left, show manipulating semaphores in Detroit. The lower photo is of a Vancouver, B.C. intersection sometime before WWII. Garrett Morgan, an African-American inventor, is usually credited with a similar style of light, however, it wasn't until 1922 that he was awarded the patent for the device and the mechanism used to rotate the flags. He sold his rights later to General Electric for $40,000. The picture shown here is the original drawing by Garrett Morgan of his signal to obtain the patent. TRAFFIC TOWERS- The next phase in the evolution of the traffic signal, was to employ the use of traffic towers. These came in a variety of shapes and sizes, with, or without electric signals mounted on them. This photo is of one with a signal atop built by the Yellow Cab Co. of Chicago. The date is 1927. Here is another, more ornate example of a traffic tower. This one was located on the busiest corner of that time in the US...Fifth and 42nd St. in New York City. This tower was made out of bronze. Some of the first signals took on interesting designs. 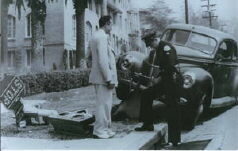 The photo at left shows Los Angeles' early experiments with traffic control. Here, they used large rectangular panels that displayed red, yellow, and green. These signals were mounted on rather large, concrete pedestals that were equipped with flashing lights to fend off unsuspecting motorists. The center photo shows a message-augmented two color signal in 1927 Rochester, NY. The right photo shows another view of the early hand-operated semaphore signal. Here's an interesting signal for you "multi-light" fans out there! Count 'em...7 lights on each of it's four sides! This signal built by the Novalux Electric Automatic Signal Company, a subsidiary of the General Electric Company, was pleased to introduce this "Safe and sane solution for the problems of traffic regulation." The signal could be operated by hand, and it was equipped with a hooded light at the top for protection of the officer operating it. William Potts of the Detroit Police Department is generally credited as the originator of the "red-yellow-green" traffic signal as we know today. An expert in communications and electrical gadgetry, his 4-way directional signal was first installed in October of 1920 at the intersection of Woodward Ave. and Fort St. Although Potts' achievement seems to not have been recognized at the time, a United States Court decision in 1928 established that he was, indeed, the inventor of the first 4-way, three-color signal. His signal, built of wood with a metal shell, used 4 inch railroad lantern-style lenses. The signal, probably of the overhead suspension type, marked another pioneering venture for Detroit when it was installed. It remained in service for four years. When Potts was appointed in 1921 as Superintendent of Signals for the Police Department, he instituted electrical interconnection of the signals of 15 of Detroit's traffic towers so that they could be controlled by a police officer from a single location. He also made other noteworthy contributions to signals in that era. Lester Wire invented this version of the traffic signal in 1912. It was installed on the corner of 2nd South St. and Main. It was made of wood and metal with 8" "railroad type" lenses and was manually controlled. Interestingly enough, when this signal was retired in the early 20's, it was moved to Liberty Park and used as a birdhouse! No one knows of it's whereabouts today. Here are three more versions of the traffic signal. A Seattle intersection is shown in the bottom picture, with both a conventional 3 color signal overhead and a traffic tower on the right. The top right photo shows a pedestal mounted two color signal with illumination at the top and warning flashers at it's base. This signal showed up in Detroit around 1923. The top left signal was called the "Attica Signal" built in 1924.It was used in Harrisburg, PA and had ten small and two large indications for traffic in both directions. This drawing further illustrates the functionality of the Attica Signal. It featured countdown lights showing motorists how much time they had before the light change. Pedestrians only saw the red and green lights as shown in the right center drawing. The device also featured a cast aluminum case. This photo shows a signal that was first installed in Long Beach. This "Banjo" signal has a disc at the top, in which an inner disc would rotate to reveal the messages along with a warning bell as the messages change. Lights would be employed at night. Pictures of a model of this type of signal showing the legends and lamp colors. The bottom light was used at night for late night flash. This example also shows how ornate and fancy poles of the day were. Everything was made rather tastefully and aesthetically then. This photo shows the Acme "semaphore" signals that were quite popular in Los Angeles in the 20's and 30's. When the signal would "change", a bell would ring and the flags on the side would exchange places via a synchronous motor. Also red and green lights were used on the head itself with a smaller light used for late night flash. The flag change took about 5 seconds. Acme signals did not have a yellow indication, as we know it today. When the signal changed, it would go red in all directions, for a few seconds. This would give traffic that was approaching the intersection a few seconds to clear the intersection, before the opposite street's signal turned to green. After dark, generally about 9:00 P.M., the arms would both fold in to the case. After that time, only the lights alone would operate. Another version used in San Francisco was the "Ghiglieri Signal" named for its inventor William Ghiglieri. It featured flashing red and green lights and earlier versions used a bell to help acquaint motorists and pedestrians alike of it's presence. This one was used on famed Market Street. This is the "Wiley Signal", and became overwhelmingly popular in San Francisco. In fact, only recently did the last one of these parish into oblivion. Curiously enough though, these never caught on outside of the city. It used a eight sided cylindrical message in the top that would rotate between "STOP" and "GO" 45 degrees, and had a bell that sounded when it changed. One can still be seen in the Cable Car Museum downtown, and two are still used, although modified a bit, at Knott's Berry Farm in Buena Park, Ca. The color of the Wiley signal head was typically yellow with a green pole. Because the base is cast iron, this signal weighs close to 200 lbs! Here is another version of the signal. This one was much smaller and was used in later years as a pedestrian signal. It featured 6" colored lenses that were embossed "STOP" and "GO". Notice the ornate controller cabinet next to this signal. Signals and cabinets during the 30's and 40's featured "art deco" manufacturing styles. Tasteful and aesthetic!! Charles Adler Jr. is credited with the title of "inventor" of the first actuated signals. The first one in daily use was at the corner of Falls road and Belvedere Avenue in Baltimore. The date was February 22, 1928. The picture above shows Baltimore's famous Traffic Commissioner Henry Barnes (left), inventor Charles Adler Jr. (center), and Assistant Traffic Commissioner Charles Upham, Jr. placing a plaque commemorating the site of the first actuated signal. This west coast intersection shows the invention in greater detail. Basically, a motorist would pull up to the intersection and blow the horn. The sound would then trigger the controller to advance to the clearance stage on the main arterial and give the right of way to the minor street for a set amount of time. Pretty ingenious for the time, but noisy! Charles also invented the first pedestrian push button actuated device. Mrs. Adler is seen here pushing the button to obtain the green light at the first one installed at the intersection of Charles Street and Cold Spring Lane in Baltimore. The date is February 4, 1929. Remnants of the early days were still to be seen around the country until well after world War II. The "block buster" 4-way signal in the above photo is on U.S. 1 in South Carolina. The tower in the lower photo was shot in Baltimore at the Maryland-Charles Street intersection. For a signalfan, this is a crime for which there is no forgiveness! All text & photos may not be reproduced without expressed written permission from webmaster.